"Diogenes" redirects here. For other uses, see Diogenes (disambiguation). Diogenes of Sinope (/daɪˈɒdʒəˌniːz/; Greek: Διογένης ὁ Σινωπεύς, Diogenēs ho Sinōpeus) was a Greek philosopher and one of the founders of Cynic philosophy. Also known as Diogenes the Cynic (Ancient Greek: Διογένης ὁ Κυνικός, Diogenēs ho Kunikos), he was born in Sinope (modern-day Sinop, Turkey), an Ionian colony on the Black Sea, in 412 or 404 BC and died at Corinth in 323 BC. Diogenes of Sinope was a controversial figure. His father minted coins for a living, and when Diogenes took to debasement of currency, he was banished from Sinope. After being exiled, he moved to Athens and criticized many cultural conventions of the city. Diogenes modelled himself on the example of Heracles. He believed that virtue was better revealed in action than in theory. He used his simple lifestyle and behaviour to criticize the social values and institutions of what he saw as a corrupt or at least confused society. In a highly non-traditional fashion, he had a reputation of sleeping and eating wherever he chose and took to toughening himself against nature. He declared himself a cosmopolitan and a citizen of the world rather than claiming allegiance to just one place. There are many tales about him dogging Antisthenes' footsteps and becoming his "faithful hound". Diogenes made a virtue of poverty. He begged for a living and often slept in a large ceramic jar in the marketplace. He became notorious for his philosophical stunts such as carrying a lamp in the daytime, claiming to be looking for an honest man. He criticized and embarrassed Plato, disputed his interpretation of Socrates and sabotaged his lectures, sometimes distracting attendees by bringing food and eating during the discussions. Diogenes was also noted for having publicly mocked Alexander the Great. After being captured by pirates and sold into slavery, Diogenes eventually settled in Corinth. There he passed his philosophy of Cynicism to Crates, who taught it to Zeno of Citium, who fashioned it into the school of Stoicism, one of the most enduring schools of Greek philosophy. None of Diogenes's many writings has survived, but details of his life come in the form of anecdotes (chreia), especially from Diogenes Laërtius, in his book Lives and Opinions of Eminent Philosophers. All that is available are a number of anecdotes concerning his life and sayings attributed to him in a number of scattered classical sources. Nothing is known about Diogenes' early life except that his father Hicesias was a banker. It seems likely that Diogenes was also enrolled into the banking business aiding his father. At some point (the exact date is unknown), Hicesias and Diogenes became embroiled in a scandal involving the adulteration or debasement of the currency, and Diogenes was exiled from the city, lost his citizenship, and all his material possessions. This aspect of the story seems to be corroborated by archaeology: large numbers of defaced coins (smashed with a large chisel stamp) have been discovered at Sinope dating from the middle of the 4th century BCE, and other coins of the time bear the name of Hicesias as the official who minted them. During this time there was a lot of counterfeit money circulating in Sinope. The coins were deliberately defaced in order to render them worthless as legal tender. Sinope was being disputed between pro-Persian and pro-Greek factions in the 4th century, and there may have been political rather than financial motives behind the act. According to one story, Diogenes went to the Oracle at Delphi to ask for its advice and was told that he should "deface the currency". Following the debacle in Sinope, Diogenes decided that the oracle meant that he should deface the political currency rather than actual coins. He traveled to Athens and made it his life's goal to challenge established customs and values. He argued that instead of being troubled about the true nature of evil, people merely rely on customary interpretations. This distinction between nature ("physis") and custom ("nomos") is a favorite theme of ancient Greek philosophy, and one that Plato takes up in The Republic, in the legend of the Ring of Gyges. Diogenes arrived in Athens with a slave named Manes who abandoned him shortly thereafter. With characteristic humor, Diogenes dismissed his ill fortune by saying, "If Manes can live without Diogenes, why not Diogenes without Manes?" Diogenes would mock such a relation of extreme dependency. He found the figure of a master who could do nothing for himself contemptibly helpless. He was attracted by the ascetic teaching of Antisthenes, a student of Socrates. When Diogenes asked Antisthenes to mentor him, Antisthenes ignored him and reportedly "eventually beat him off with his staff". Diogenes responds, "Strike, for you will find no wood hard enough to keep me away from you, so long as I think you've something to say." Diogenes became Antisthenes' pupil, despite the brutality with which he was initially received. Whether the two ever really met is still uncertain, but he surpassed his master in both reputation and the austerity of his life. He considered his avoidance of earthly pleasures a contrast to and commentary on contemporary Athenian behaviors. This attitude was grounded in a disdain for what he regarded as the folly, pretense, vanity, self-deception, and artificiality of human conduct. The stories told of Diogenes illustrate the logical consistency of his character. He inured himself to the weather by living in a clay wine jar belonging to the temple of Cybele. He destroyed the single wooden bowl he possessed on seeing a peasant boy drink from the hollow of his hands. He then exclaimed: "Fool that I am, to have been carrying superfluous baggage all this time!" It was contrary to Athenian customs to eat within the marketplace, and still he would eat there, for, as he explained when rebuked, it was during the time he was in the marketplace that he felt hungry. He used to stroll about in full daylight with a lamp; when asked what he was doing, he would answer, "I am just looking for an honest man." Diogenes looked for a human being but reputedly found nothing but rascals and scoundrels. When Plato gave Socrates's definition of man as "featherless bipeds" and was much praised for the definition, Diogenes plucked a chicken and brought it into Plato's Academy, saying, "Behold! I've brought you a man." After this incident, "with broad flat nails" was added to Plato's definition. According to a story which seems to have originated with Menippus of Gadara, Diogenes was captured by pirates while on voyage to Aegina and sold as a slave in Crete to a Corinthian named Xeniades. Being asked his trade, he replied that he knew no trade but that of governing men, and that he wished to be sold to a man who needed a master. In fact, this was a pun. In ancient Greek this would sound both as "Governing men" and "Teaching values to people". Xeniades liked his spirit and hired Diogenes to tutor his children. As tutor to Xeniades's two sons, it is said that he lived in Corinth for the rest of his life, which he devoted to preaching the doctrines of virtuous self-control. There are many stories about what actually happened to him after his time with Xeniades's two sons. 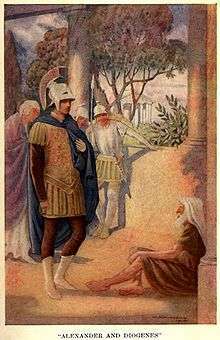 There are stories stating he was set free after he became "a cherished member of the household", while one says he was set free almost immediately, and still another states that "he grew old and died at Xeniades's house in Corinth." He is even said to have lectured to large audiences at the Isthmian Games. A report that Philip II of Macedon was marching on the town had thrown all Corinth into a bustle; one was furbishing his arms, another wheeling stones, a third patching the wall, a fourth strengthening a battlement, every one making himself useful somehow or other. Diogenes having nothing to do – of course no one thought of giving him a job – was moved by the sight to gather up his philosopher's cloak and begin rolling his tub energetically up and down the Craneum; an acquaintance asked for the reason, and got the explanation: "I do not want to be thought the only idler in such a busy multitude; I am rolling my tub to be like the rest." It was in Corinth that a meeting between Alexander the Great and Diogenes is supposed to have taken place. These stories may be apocryphal. The accounts of Plutarch and Diogenes Laërtius recount that they exchanged only a few words: while Diogenes was relaxing in the morning sunlight, Alexander, thrilled to meet the famous philosopher, asked if there was any favour he might do for him. Diogenes replied, "Yes, stand out of my sunlight". Alexander then declared, "If I were not Alexander, then I should wish to be Diogenes." In another account of the conversation, Alexander found the philosopher looking attentively at a pile of human bones. Diogenes explained, "I am searching for the bones of your father but cannot distinguish them from those of a slave." There are conflicting accounts of Diogenes's death. He is alleged variously to have held his breath; to have become ill from eating raw octopus; or to have suffered an infected dog bite. When asked how he wished to be buried, he left instructions to be thrown outside the city wall so wild animals could feast on his body. When asked if he minded this, he said, "Not at all, as long as you provide me with a stick to chase the creatures away!" When asked how he could use the stick since he would lack awareness, he replied "If I lack awareness, then why should I care what happens to me when I am dead?" At the end, Diogenes made fun of people's excessive concern with the "proper" treatment of the dead. The Corinthians erected to his memory a pillar on which rested a dog of Parian marble. Along with Antisthenes and Crates of Thebes, Diogenes is considered one of the founders of Cynicism. The ideas of Diogenes, like those of most other Cynics, must be arrived at indirectly. No writings of Diogenes survive even though he is reported to have authored over ten books, a volume of letters and seven tragedies. Cynic ideas are inseparable from Cynic practice; therefore what we know about Diogenes is contained in anecdotes concerning his life and sayings attributed to him in a number of scattered classical sources. Diogenes maintained that all the artificial growths of society were incompatible with happiness and that morality implies a return to the simplicity of nature. So great was his austerity and simplicity that the Stoics would later claim him to be a wise man or "sophos". In his words, "Humans have complicated every simple gift of the gods." Although Socrates had previously identified himself as belonging to the world, rather than a city, Diogenes is credited with the first known use of the word "cosmopolitan". When he was asked where he came from, he replied, "I am a citizen of the world (cosmopolites)". This was a radical claim in a world where a man's identity was intimately tied to his citizenship in a particular city state. An exile and an outcast, a man with no social identity, Diogenes made a mark on his contemporaries. Diogenes had nothing but disdain for Plato and his abstract philosophy. Diogenes viewed Antisthenes as the true heir to Socrates, and shared his love of virtue and indifference to wealth, together with a disdain for general opinion. Diogenes shared Socrates's belief that he could function as doctor to men's souls and improve them morally, while at the same time holding contempt for their obtuseness. Plato once described Diogenes as "a Socrates gone mad." Diogenes taught by living example. He tried to demonstrate that wisdom and happiness belong to the man who is independent of society and that civilization is regressive. He scorned not only family and political social organization, but also property rights and reputation. He even rejected normal ideas about human decency. Diogenes is said to have eaten in the marketplace, urinated on some people who insulted him, defecated in the theatre, and masturbated in public. When asked about his eating in public he said, "If taking breakfast is nothing out of place, then it is nothing out of place in the marketplace. But taking breakfast is nothing out of place, therefore it is nothing out of place to take breakfast in the marketplace." On the indecency of him masturbating in public he would say, "If only it were as easy to banish hunger by rubbing my belly." From Life of Diogenes: "Someone took him [Diogenes] into a magnificent house and warned him not to spit, whereupon, having cleared his throat, he spat into the man's face, being unable, he said, to find a meaner receptacle." Many anecdotes of Diogenes refer to his dog-like behavior, and his praise of a dog's virtues. It is not known whether Diogenes was insulted with the epithet "doggish" and made a virtue of it, or whether he first took up the dog theme himself. When asked why he was called dog he replied, "I fawn on those who give me anything, I yelp at those who refuse, and I set my teeth in rascals." 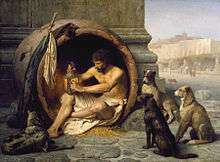 Diogenes believed human beings live artificially and hypocritically and would do well to study the dog. Besides performing natural body functions in public with ease, a dog will eat anything, and make no fuss about where to sleep. Dogs live in the present without anxiety, and have no use for the pretensions of abstract philosophy. In addition to these virtues, dogs are thought to know instinctively who is friend and who is foe. Unlike human beings who either dupe others or are duped, dogs will give an honest bark at the truth. Diogenes stated that "other dogs bite their enemies, I bite my friends to save them." 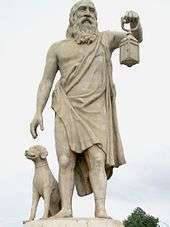 As noted (see Death), Diogenes' association with dogs was memorialized by the Corinthians, who erected to his memory a pillar on which rested a dog of Parian marble. Diogenes is discussed in a 1983 book by German philosopher Peter Sloterdijk (English language publication in 1987). In his Critique of Cynical Reason, Diogenes is used as an example of Sloterdijk's idea of the "kynical" — in which personal degradation is used for purposes of community comment or censure. Calling the practice of this tactic "kynismos", Sloterdijk explains that the kynical actor actually embodies the message he is trying to convey. The goal here is typically a false regression that mocks authority — especially authority that the kynical actor considers corrupt, suspect or unworthy. There is another discussion of Diogenes and the Cynics in Michel Foucault's book Fearless Speech. Here Foucault discusses Diogenes' antics in relation to the speaking of truth (parrhesia) in the ancient world. Foucault expands this reading in his last course at the Collège de France, The Courage of Truth. In this course Foucault tries to establish an alternative conception of militancy and revolution through a reading of Diogenes and Cynicism. Diogenes's name has been applied to a behavioural disorder characterised by involuntary self-neglect and hoarding. The disorder afflicts the elderly and has no relation to Diogenes's deliberate rejection of material comfort. Both in ancient and in modern times, Diogenes's personality has appealed strongly to sculptors and to painters. Ancient busts exist in the museums of the Vatican, the Louvre, and the Capitol. The interview between Diogenes and Alexander is represented in an ancient marble bas-relief found in the Villa Albani. Among artists who have painted the famous encounter of Diogenes with Alexander, there are works by de Crayer, de Vos, Assereto, Langetti, Sevin, Sebastiano Ricci, Gandolfi, Johann Christian Thomas Wink, Abildgaard, Monsiau, Martin, and Daumier. The famous story of Diogenes searching for an "honest man" has been depicted by Jordaens, van Everdingen, van der Werff, Pannini, and Corinth. Others who have painted him with his famous lantern include de Ribera, Castiglione, Petrini, Gérôme, Bastien-Lepage, and Waterhouse. The scene in which Diogenes discards his cup has been painted by Poussin, Rosa, and Martin; and the story of Diogenes begging from a statue has been depicted by Restout. In Raphael's fresco The School of Athens, a lone reclining figure in the foreground represents Diogenes. Diogenes has also been the subject of sculptures, with famous bas-relief images by Puget and Pajou. The many allusions to dogs in Shakespeare's Timon of Athens are references to the school of Cynicism that could be interpreted as suggesting a parallel between the misanthropic hermit, Timon, and Diogenes; but Shakespeare would have had access to Michel de Montaigne's essay, "Of Democritus and Heraclitus", which emphasised their differences: Timon actively wishes men ill and shuns them as dangerous, whereas Diogenes esteems them so little that contact with them could not disturb him "Timonism" is in fact often contrasted with "Cynicism": "Cynics saw what people could be and were angered by what they had become; Timonists felt humans were hopelessly stupid & uncaring by nature and so saw no hope for change." The philosopher's name was adopted by the fictional Diogenes Club, an organization that Sherlock Holmes' brother Mycroft Holmes belongs to in the story "The Greek Interpreter" by Sir Arthur Conan Doyle. It is called such as its members are educated, yet untalkative and have a dislike of socialising, much like the philosopher himself. The group is the focus of a number of Holmes pastiches by Kim Newman. In the Rodgers and Hart musical The Boys From Syracuse (1938), the song Oh Diogenes!—which extols the philosopher's virtues—contains the lyrics "there was an old zany/ who lived in a tub;/ he had so many flea-bites / he didn't know where to rub." 1 2 3 4 Diogenes of Sinope "The Zen of Disengagement: Diogene of Sinope". Voice in the Wilderness. Archived from the original on 2015-10-17. ↑ Laërtius & Hicks 1925, Ⅵ:79, Plutarch, Moralia, 717c. says he died on the same day as Alexander the Great, which puts his death at 323 BC. Diogenes Laërtius's statement that Diogenes died "nearly 90" would put his year of birth at 412 BC. But Censorinus (De die natali, 15.2) says he died aged 81, which puts his year of birth at 404 BC. The Suda puts his birth at the time of the Thirty Tyrants, which also gives 404 BC. 1 2 3 The original Greek word describing Diogenes' "jar" is pithos, a large jar for storing wine, grain or olive oil. Modern variations include barrel, tub, vat, wine-vat, and kennel. Desmond, William (2008). Cynics. University of California Press. p. 21. ↑ Diogenes of Sinope "The Basics of Philosophy". Retrieved November 13, 2011. ↑ (Laërtius & Hicks 1925, Ⅵ:20). A trapezites was a banker/money-changer who could exchange currency, arrange loans, and was sometimes entrusted with the minting of currency. ↑ Navia, Diogenes the Cynic, pg 226: "The word paracharaxis can be understood in various ways such as the defacement of currency or the counterfeiting of coins or the adulteration of money." ↑ C. T. Seltman, Diogenes of Sinope, Son of the Banker Hikesias, in Transactions of the International Numismatic Congress 1936 (London 1938). ↑ Laërtius & Hicks 1925, Ⅵ:55 ; Seneca, De Tranquillitate Animi, 8.7.; Aelian, Varia Historia, 13.28. ↑ Laërtius & Hicks 1925, Ⅵ:21 ; Aelian, Varia Historia, 10.16.; Jerome, Adversus Jovinianum, 2.14. ↑ Laërtius & Hicks 1925, Ⅵ:23 ; Jerome, Adversus Jovinianum, 2.14. ↑ Laërtius & Hicks 1925, Ⅵ:37 ; Seneca, Epistles, 90.14.; Jerome, Adversus Jovinianum, 2.14. ↑ Laërtius & Hicks 1925, Ⅵ:41. Modern sources often say that Diogenes was looking for an "honest man", but in ancient sources he is simply looking for a "human" (anthrôpos). The unreasoning behavior of the people around him means that they do not qualify as human. ↑ "Diogenes of Sinope". Internet Encyclopedia of Philosophy. 2006-04-26. Retrieved 2011-11-13. ↑ Laërtius & Hicks 1925, Ⅵ:32; Plutarch, Alexander, 14, On Exile, 15. 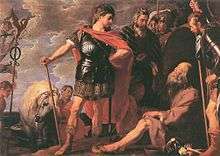 ↑ This story appears frequently in books from the 16th to the 19th century, and may be an example of an anecdote invented about Diogenes in modern times. There is a similar anecdote in one of the dialogues of Lucian (Menippus, 15) but that story concerns Menippus in the underworld. ↑ Laërtius & Hicks 1925, Ⅵ:76; Athenaeus, 8.341. ↑ Cicero, Tusculanae Quaestiones, 1.43. 1 2 Laërtius & Hicks 1925, Ⅵ:78; Greek Anthology, 1.285.; Pausanias, 2.2.4. ↑ Cicero, Tusculanae Quaestiones, 5.37.; Plutarch, On Exile, 5.; Epictetus, Discourses, i.9.1. ↑ Laërtius & Hicks 1925, Ⅵ:63. Compare: Laërtius & Hicks 1925, Ⅵ:72, Dio Chrysostom, Or. 4.13, Epictetus, Discourses, iii.24.66. ↑ Laërtius & Hicks 1925, Ⅵ:54 ; Aelian, Varia Historia, 14.33. ↑ Laërtius & Hicks 1925, Ⅵ:58,69. Eating in public places was considered bad manners. ↑ Dio Chrysostom, Or. 8.36; Julian, Orations, 6.202c. ↑ Laërtius & Hicks 1925, Ⅵ:34-35 ; Epictetus, Discourses, iii.2.11. Pointing with one's middle finger was considered insulting; with the finger pointing up instead of to another person, the finger gesture is considered obscene in modern times. ↑ Diogenes of Sinope, quoted by Stobaeus, Florilegium, iii. 13. 44. ↑ Laërtius & Hicks 1925, Ⅵ:13. Cf. The Oxford Companion to Classical Literature, 2nd edition, p. 165. ↑ Possum Living by Dolly Freed Archived January 21, 2009, at the Wayback Machine. ↑ Alexander: The Ends of the Earth by Valerio Manfredi. Retrieved 2013-04-15. ↑ Hugh Grady, "A Companion to Shakespeare's Works", Dutton. R & Howard J., Blakewell Publishing, 2003, ISBN 0-631-22632-X, p.443-444. ↑ Paul Ollswang, "Cynicism: A Series of Cartoons on a Philosophical Theme", January 1988, page B at official site; repr. in The Best Comics of the Decade 1980-1990 Vol. 1, Seattle, 1990, ISBN 1-56097-035-9, p. 23. Desmond, William D. 2008. Cynics. Acumen / University of California Press. Laërtius, Diogenes; Plutarch (1979). Herakleitos & Diogenes. translated by Guy Davenport. Bolinas, California: Grey Fox Press. ISBN 0-912516-36-4. Laërtius, Diogenes (1972) . "Διογένης (Diogenes)". Βίοι καὶ γνῶμαι τῶν ἐν φιλοσοφίᾳ εὐδοκιμησάντων [Lives of eminent philosophers]. Volume 2. translated by Robert Drew Hicks (Loeb Classical Library ed.). Cambridge, Massachusetts: Harvard University Press. ISBN 0-674-99204-0. Retrieved 2010-09-14. Cutler, Ian (2005). Cynicism from Diogenes to Dilbert. Jefferson, Va.: McFarland & Company, Inc. ISBN 0-7864-2093-6. Mazella, David (2007). The making of modern cynicism. Charlottesville, Va.: University of Virginia Press. ISBN 978-0-8139-2615-5. Navia, Luis E. (1996). Classical cynicism : a critical study. Westport, CT: Greenwood Press. ISBN 0-313-30015-1. Navia, Luis E. (1998). Diogenes of Sinope : the man in the tub. Westport, CT: Greenwood Press. ISBN 0-313-30672-9. Sayre, Farrand (1938). Diogenes of Sinope: A Study of Greek Cynicism. Baltimore: J.H. Furst. Shea, Louisa (2010). The cynic enlightenment : Diogenes in the salon. Baltimore: Johns Hopkins University Press. ISBN 978-0-8018-9385-8. 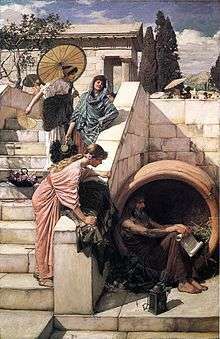 Wikimedia Commons has media related to Diogenes of Sinope. "Diogenes of Sinope". Internet Encyclopedia of Philosophy.